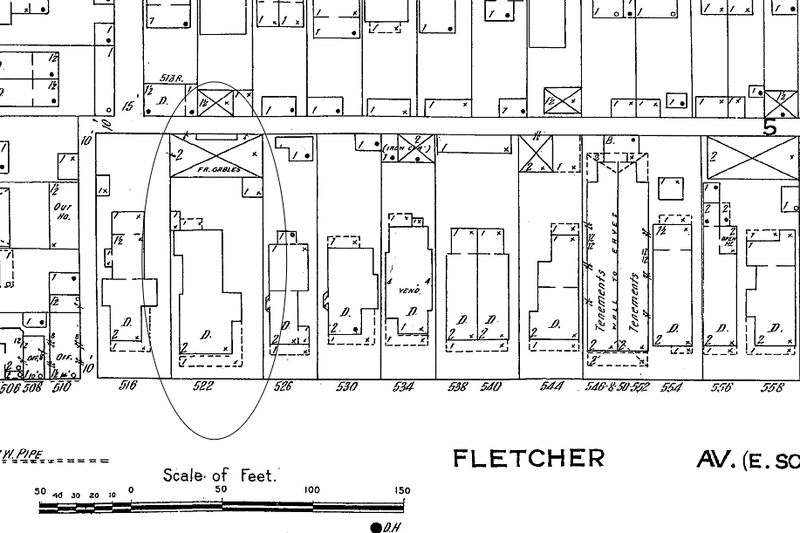 Due to the large population increase of downtown in 1890-1920, the addition of apartments was absolutely necessary; Fletcher Place was one neighborhood that built flats very early during this increase. 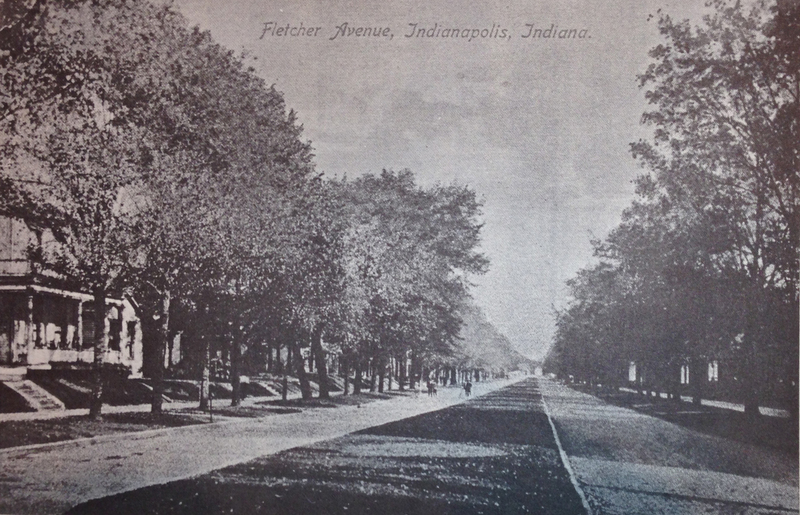 The irregularly shaped Fletcher Place neighborhood was one of the “first developments adjacent to the Mile Square” and housed many residents that were significant in regards to the “architecture, religion, commerce, education, and social life in the city.” (Interim Report, Center Township, Marion County, Indiana Historic Site & Structures Inventory, 1991) Named after Calvin Fletcher, Sr. (1798-1866), who originally owned the land as his farm, which he called Wood Lawn. Born in Ludlow, Vermont, Fletcher came to Indianapolis in 1821 to set up a law practice with Ovid Butler (founder of Butler University) and Simon Yandes; he was also the director of the State Bank of Indiana for 16 years and appointed to the Indianapolis Board of School Trustees (IHPC Fletcher Place Historic District Survey, 1980). He also donated funds to the construction of many early churches downtown, including the Fletcher Place United Methodist Church, which was built on the site of the early Fletcher home (IHPC Survey, 1980). 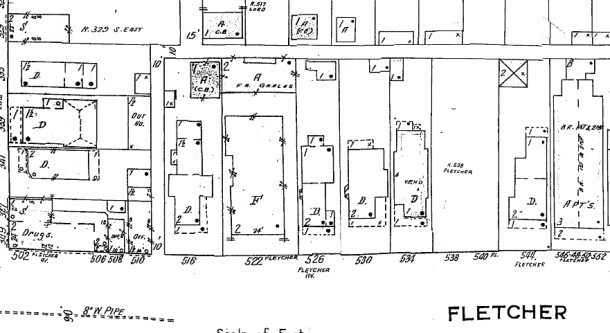 In the 1850’s, many German and Irish immigrants settled in the area; by the 1860’s, there were many large houses on Fletcher Avenue, with smaller cottages to the northern and southern streets (Interim Report 1991). A majority of the buildings in this area were constructed between 1865 and 1890. The IHPC survey of the district described the area as “small, narrow lots, uniform building setbacks, a network of alleys and narrow streets, mature vegetation, and intact rows of detached, one-story cottages and two-story houses contribute to the unique fabric of the district.” (IHPC Survey, 1980) Around this time, Virginia Avenue was developing as the main commercial street, which connected Fountain Square, Fletcher Place, and the Mile Square. Large Italianate homes and vernacular cottages dominated the area. The neighborhood’s residents were of many classes; prominent citizens resided in larger houses, and the many cottages were occupied by “drivers, glass blowers, blacksmiths, painters, laborers, and others who often worked in the nearby businesses.” (IHPC Survey, 1980) Sometime before 1887 and until 1942, grassy esplanades existed in the center of Fletcher Avenue (IHPC Survey, 1980). 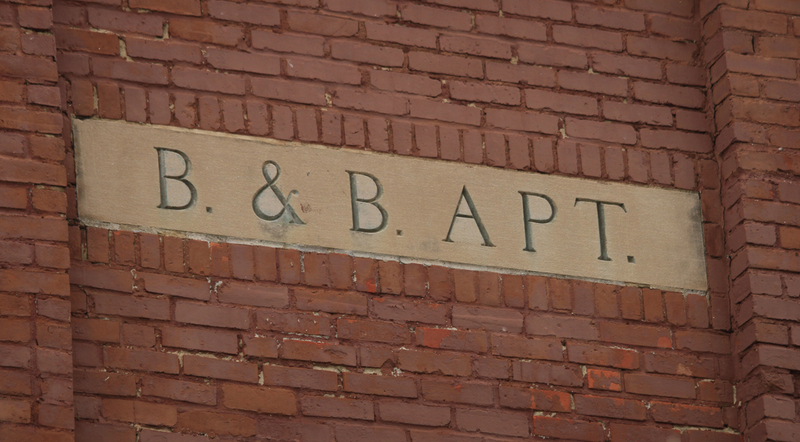 It is important to recognize that only a remnant of this much bigger neighborhood remains today. Unfortunately, hundreds of homes were demolished during the construction of the interstate, which has left the neighborhood isolated from Fountain Square and Bates-Hendricks. 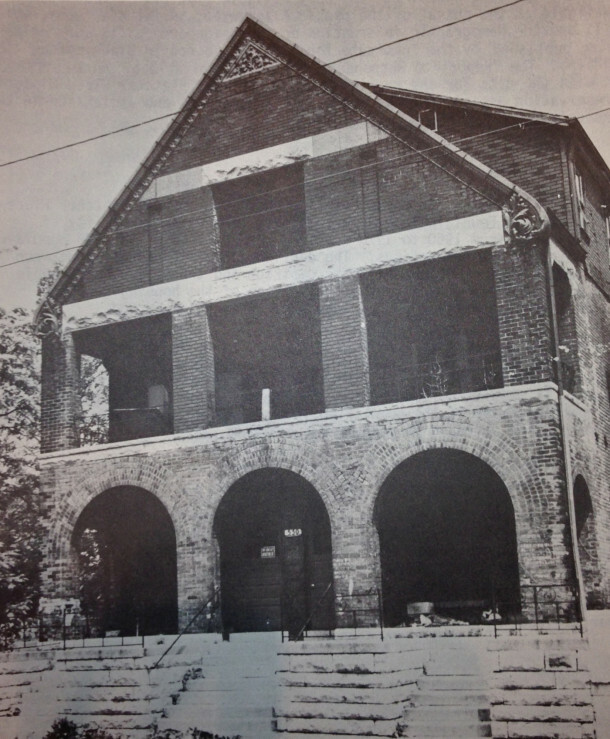 Most of the structures remaining retain their original character of late 19th century architecture (IHPC Fletcher Place Historic District Survey, 1980). 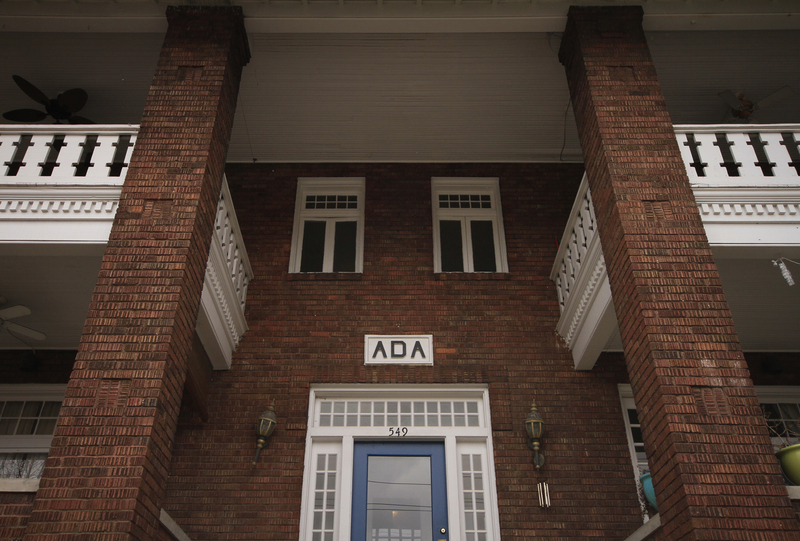 The Ada Apartments, located at 549 Fletcher Avenue, were built in 1911. 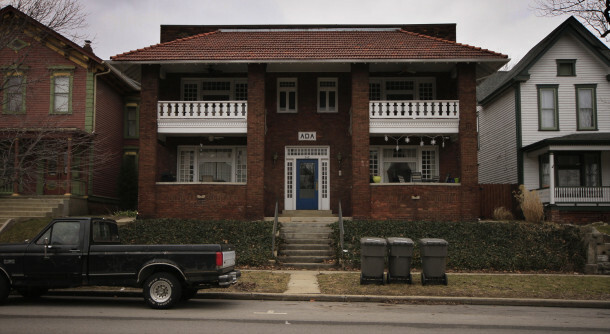 It is listed in the Fletcher Place Historic District as contributing but not included in the NRHP for Apartments & Flats; in fact, none of the apartments in this article are listed in the NRHP for Apartments & Flats. 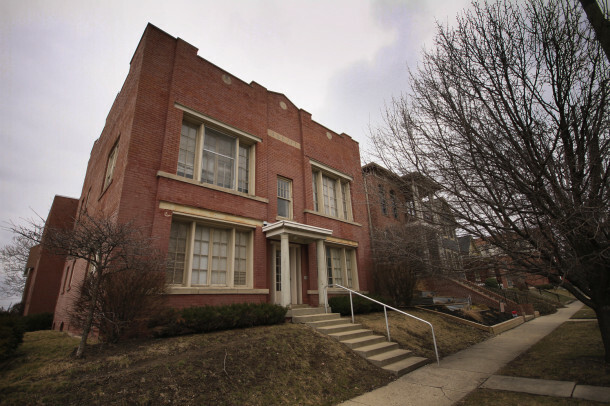 The two-story brick building has an interesting clay pan-tile roof one does not see on Indianapolis apartments very often – the Craftsman/Mission style is similar to the Coulter Flats on 2161 North Meridian Street. The building also has interesting porch details and windows. The flats were included in a candlelight home tour, focused on raising money to benefit the public areas and parks of Fletcher Place; eight residencies and two businesses that had all recently undergone renovations were included (“Fletcher Place Prepares for Tour,” Ruth Mullen, Indianapolis Star, 12/11/1999). 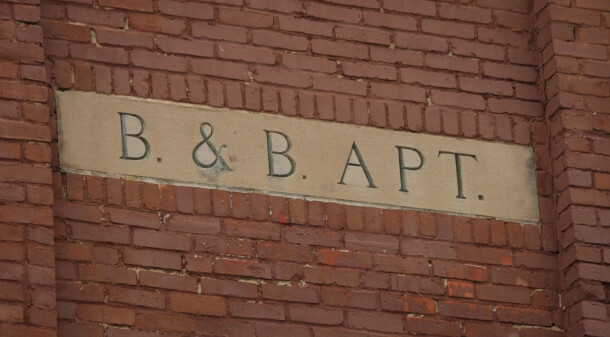 Built in 1928, the B&B Apartments are located at 522 Fletcher Avenue. These brick apartments were built around a large, two story brick home. 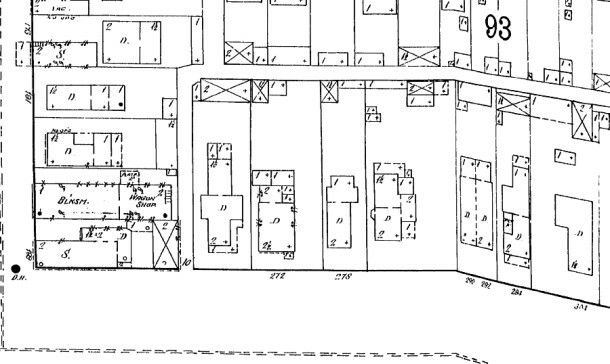 Through the Sanborn maps included, one can see the evolution of the property. 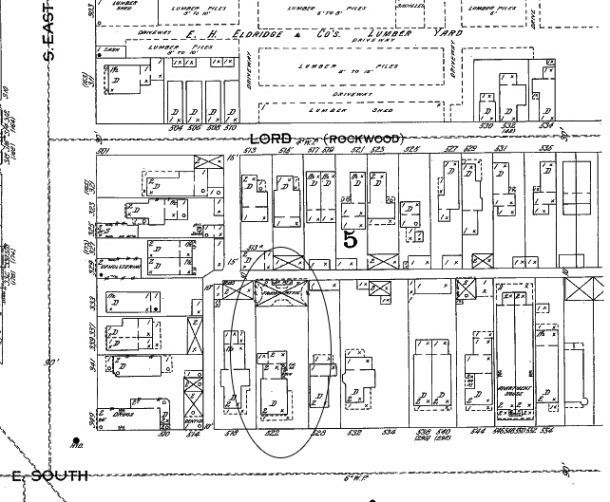 David D. Long, an agent for Munday & Snyder, and his wife Elizabeth purchased the lot in 1869 (IHPC Survey, 1980). They lived at 222 East South Street until the home was completed in 1874, where they stayed for nine years. In 1890, Rhomas and Russie Stout moved in; during this time they constructed the barn/carriage home and sometime before 1898 added the large wrap around porch where the original stoop was. Also between 1887 and 1898, smaller one-story sections to the house became two-stories. Between 1898 and 1914, the east side of the home was expanded to meet with the edge of the wrap around porch. The back of the house was also added on to, which made it as deep as the home to the west of it. Beyond the section that juts out in the image below is where the back addition took place. This was all two-stories except for two very small sections in the very back of the addition. 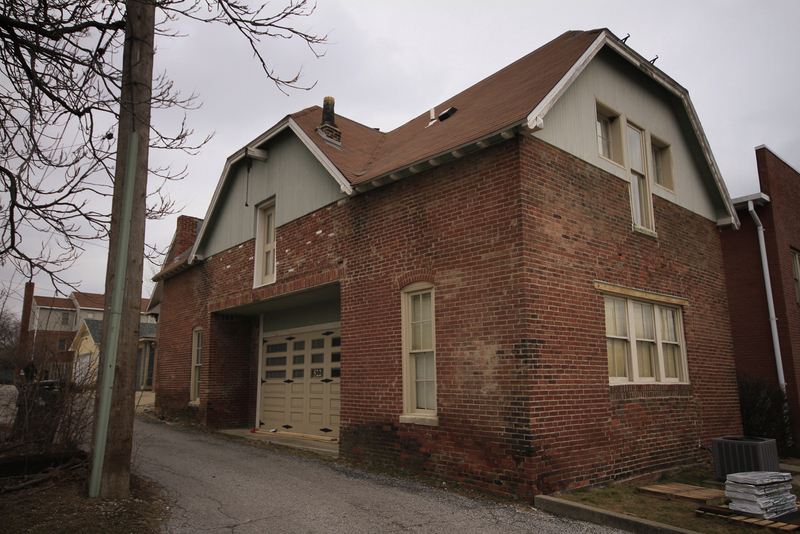 Between 1915 and 1950, a small one-story addition to the carriage home and the wrap around porch were removed. In 1928, the home was expanded again and converted into apartment units. The western wall that juts in still remains, but the back was added on to once more. 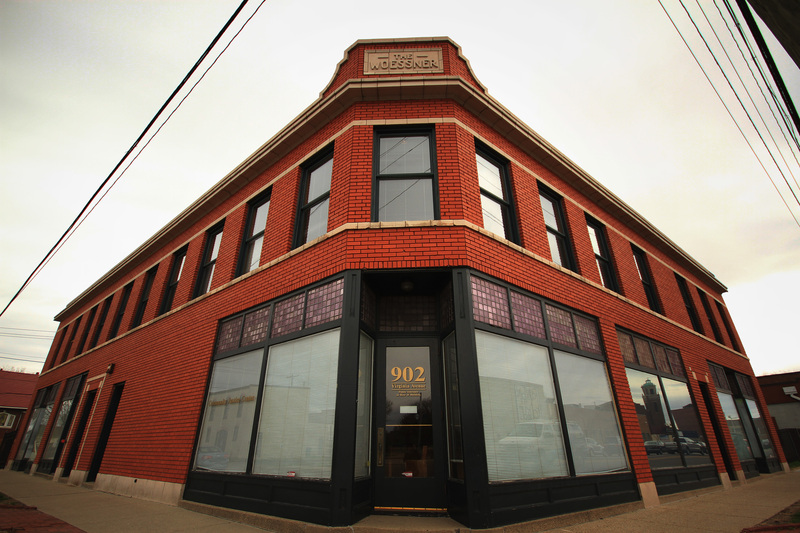 Also, the east side of the building was pushed out in the back half to line up with the front of the building. The B&B has a very interesting parapet in front, as well as deco windows, columns flanking the entrance, and three limestone inserts near the cornice. In 1914, the home was owned by Thomas O. Stout and his wife. He, along with Claude O. Stout and Jacob Shaffer died that year when an interurban car hit them near the Spring Valley crossing (“Auto Crash Survivors to Leave Hospital Soon,” Indianapolis Star, 5/26/1914). By 1923, the Indianapolis College of Pharmacy was using the property, including an American Pharmaceutical Association’s conference on the medicinal value of food (Indianapolis Star, 5/7/1923). At some point, it was also a location for Butler University’s pre-med program (“Turning Back the Clock – By a Century,” Mary Francis, Indianapolis Star, 8/2/1995). 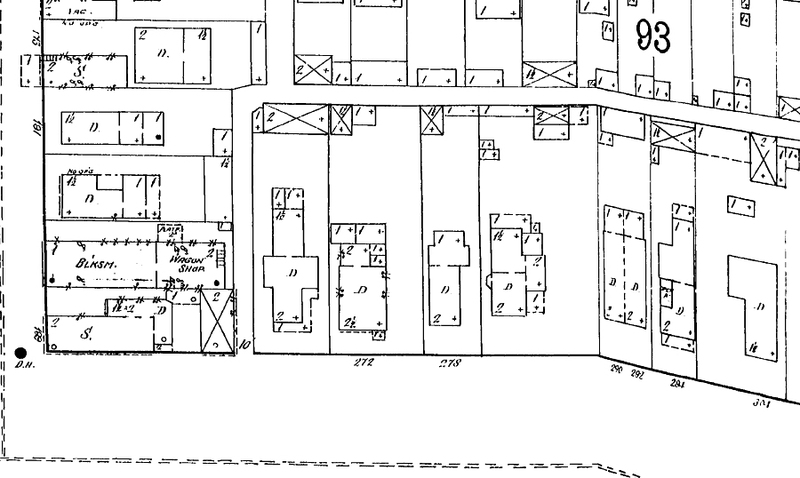 The barn or carriage home, constructed around 1890, (labeled “frame attic” on the Sanborn map) in the back of the property also has an interesting history. The first floor opening is rather large, but has remained that size since at least 1898, which is quite unusual. 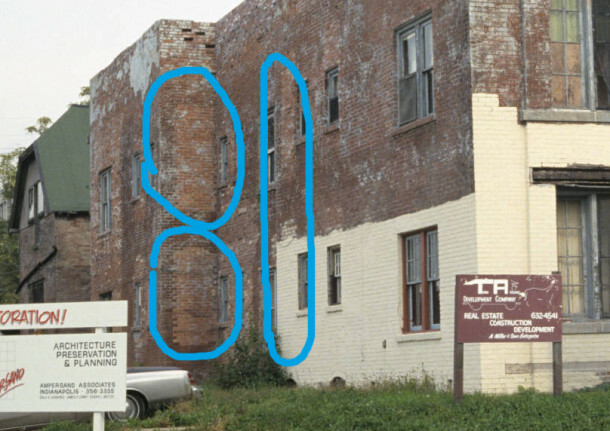 Brick and mortar differences indicate a second door way on the west side of the structure, which wouldn’t make sense when another carriage home was located on the lot to the west. However, the area could be explained as an altered eave. Some of the windows have also been altered. Other significant elements of the structure are the jerkinhead roof, the pulley in the north gable, and the stick style corner braces (IHPC Survey, 1980). 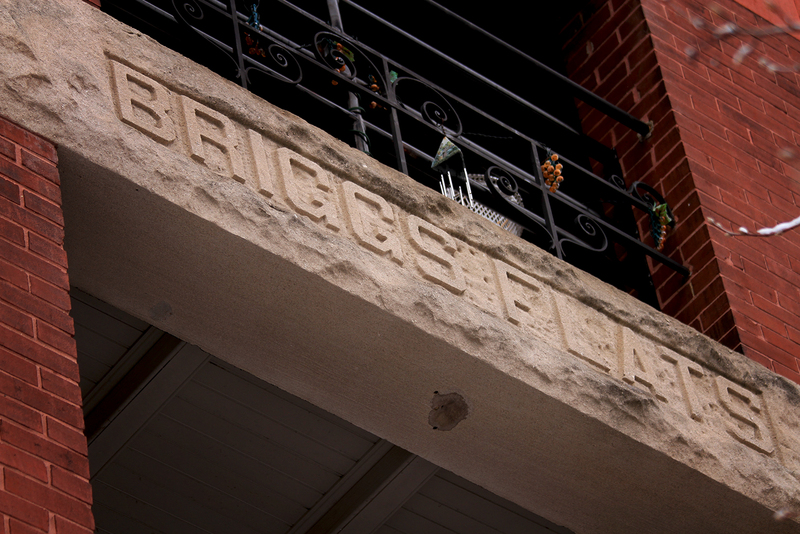 The Briggs Flats is one of the earliest apartment buildings in the city, built in 1893. 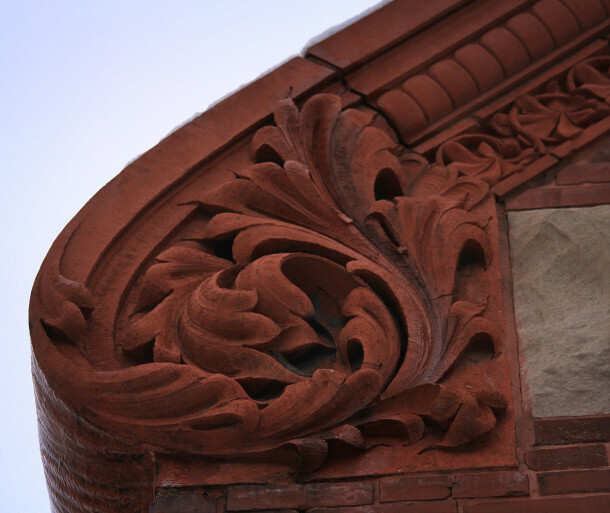 Located at 550 Fletcher Avenue, it possesses a great deal of terra cotta detailing near the cornice and gable ends. 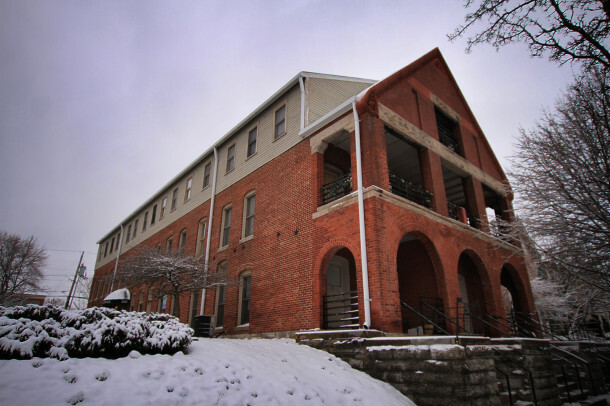 The three-story red brick building also has rock faced limestone lintels on the second and third level trabeated openings (IHPC Survey, 1980). The massive Richardsonian Romanesque arches in the front make the building very unique, especially for a multi-family building in Indianapolis. It was most likely built by Tarquina Voss, a local wealthy woman who built houses in many areas downtown, including the Old Northside and Fletcher Place (IHPC Survey, 1980). The B&B Apartments and the Briggs Flats were purchased by Indiana Landmarks to help save them from demolition. 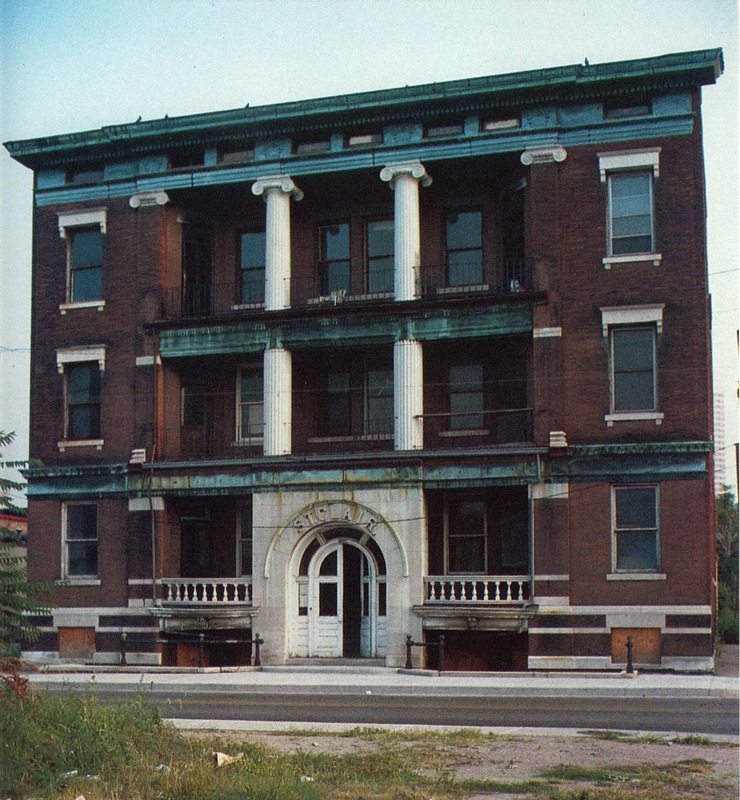 They were a focus on the 1995 $4.9 million project to renovate select buildings in Fletcher Place (“Southside Neighborhood Will Get Major Facelift,” Robert N. Bell, Indianapolis News, 12/5/1995). The Briggs Flats were renovated into one- and two-bedroom units; the intention was for more affordable housing, which meant a resident can only make 50-60% of Marion County’s median income (“Turning Back the Clock – By a Century,” 8/2/1995). In 1995, this was $36,000. 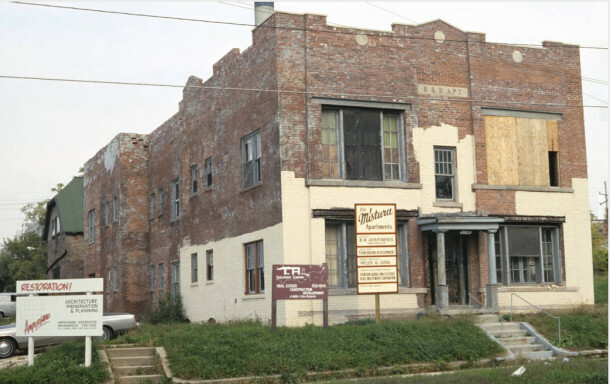 By 1996, the 15-year vacant Briggs and ten-year vacant B&B apartments were renovated: local groups SEND and CCDC helped coordinate $2.5 million to be spent to fully renovate the structures (“Downtown Apartments Get Renovated Leases on Life,” Rebecca Bibbs, Indianapolis Star, 9/14/1996). Will stay with this blog. Very informative! Jordan — very well done. I have often wondered about that name Yandes — a street perhaps on the near northwest side? — and during the census I worked some of that area and there are some excellent views of downtown from that quarter. Have you walked the new “cultural” trail down along Virginia Ave.? That new apt/condo building right at the point of south street and Vir. Ave. [across from the old Fletcher Place Meth. Ch. site] is a neat building with excellent views of downtown. They have perhaps added some more amenities on the ground floor since 2010. Yandes Street is not on the near northwest side. It’s just east of, and parallel to, the Monon Trail. Yandes Street originally began near Roosevelt Avenue (about 1200 north of Washington and about 1200 east of Meridian) and ran continuously up to 25th Street on the north end. When I-70 and I-65 were constructed, the highway cut through Yandes Street and interrupted its continuity near its south end. If Yandes Street had continued further north into Washington Township, it would be geographically about where Carvel Avenue or Compton Street is located. Simon Yandes (1816 – 1903) was a law partner of Ovid Butler and Calvin Fletcher. 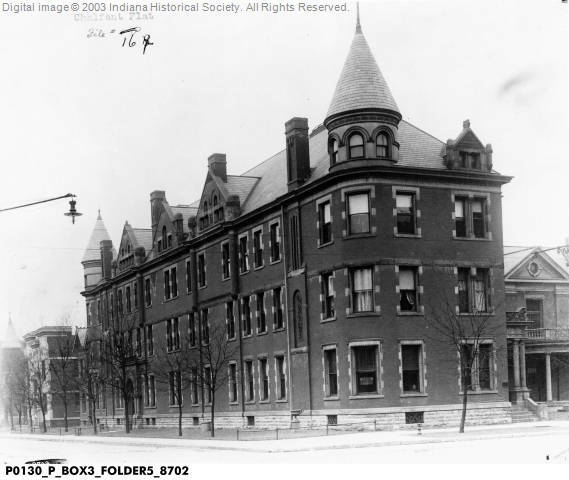 As you may know, the original location of Butler University (then called North Central Christian University) was at 13th and College on land owned by Ovid Butler. The land immediately east of Butler’s was owned by the Fletcher family. No doubt Yandes’ civic accomplishments made him worthy of having a street named after him. However, I also think that Yandes’ association with Butler and Fletcher may have had something to do with where the street named for Yandes was, since it was in the same vicinity as the land his partners owned. My husband Mike’s great-great-great-great-grandparents (that’s 4 greats!) were Elder Elijah Martindale (1793-1874) and Elizabeth Boyd Martindale (1792-1884). Their son, Elijah Bishop Martindale (1828-1910) was the attorney, journalist, judge, and senator who amassed large tracts of land in Indianapolis and made them into housing additions, i.e., neighborhoods. Mike’s great-great-great (that’s 3 greats!) grandfather, Samuel Perry Martindale, Sr. (1820-1903) was the older brother of Elijah Bishop Martindale of 19th century Indianapolis fame. Samuel Martindale resided in Irvington for a few years in the 1870s and 1880s, while his children were attending North Western Christian University, but having lived most of his life in small towns, Mike’s ancestor returned to his more rural roots in his golden years. Samuel Martindale is buried in Tipton County, where many of the Martindale and Blount relatives resided. Elijah Martindale of course remained in Indianapolis for the rest of his life. He and many of his descendants are buried at Crown Hill Cemetery. Elijah Bishop Martindale was one of the three businessmen who platted Morton Place! (Alongside Edward F. Claypool and Willard W. Hubbard). Sharon, the lineage you presented was fantastic! It’s wild how family names like Martindale, Yandes, Fletcher, English, Lilly, Fortune, Downey, and ones that I should remember maintain their stability over time even as the city grows and new players come to the fore! Another interesting write-up, Sharon. Thanks. Jordan, What is the IHPC ? IHPC is the Indianapolis Historic Preservation Commission. 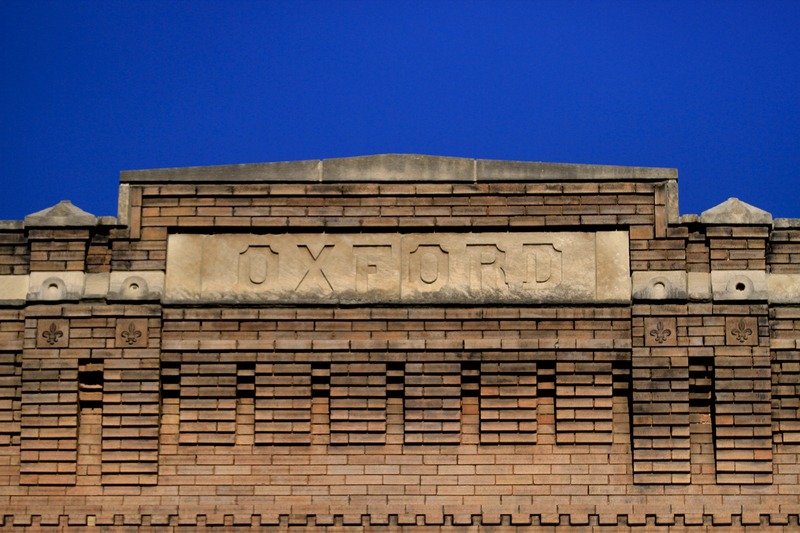 They are located in the City County building and are the body who oversee the historic designated neighborhoods. Thanks for the facts Sharon. I first made the Yandes connection when I learned that Bill Selm was trying to get the old warehouse buildings on Yandes near 22nd St and the Monon trail on the National Register. Norm – I totally agree, great views! I think there’s just a gym and spa on the first floor now. 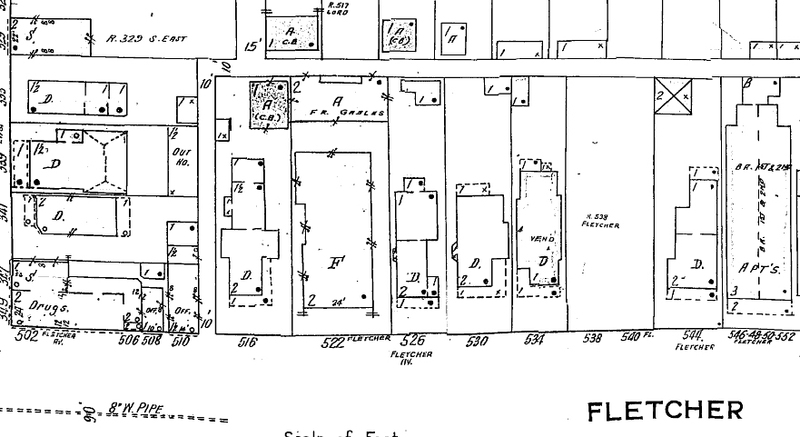 I know this is not strictly on the topic of flats saved, but it is about the Fletcher Place neighborhood, and it is about a home that was not saved. 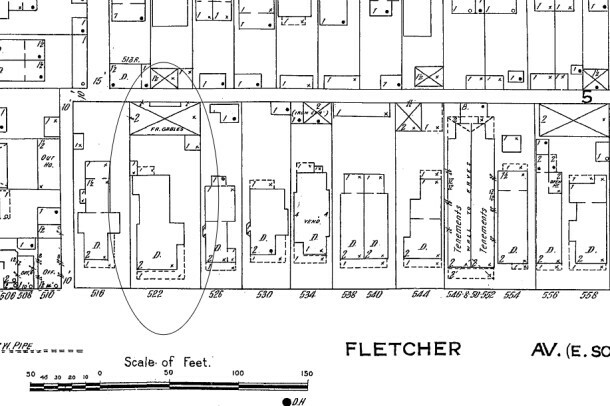 Four generations of my family lived in the same house in Fletcher Place over the years. My great-great-grandmother, Maria Helfrich Butsch (1824-1898) built a home on Greer Street in 1880. She had been a widow for a number of years after my great-great-grandfather, Peter Butsch (1812-1864) died in the Civil War. Left alone to raise five boys, Maria pursued the federal government for fifteen years, until she finally received the pension to which she was entitled. She put that money towards building a house. Maria’s youngest son, my great-grandfather Frank J. Butsch, Sr. (1864-1948), inherited the home on Greer Street when Maria died and raised his family there. My grandfather’s brother Frederick H. Butsch (1896-1961) then inherited the house from my great-grandfather when he died and raised his family there. My relatives lived there until after Fred died, when they decided to move to the suburbs. Four generations of my Butsch relatives lived in the same house for more than 80 years! Sadly, after my relatives sold the house, it caught fire and burned. The lot on which the house once stood is now a part of the neighbor’s yard. If the old Butsch house were still standing, I might try to buy it and become yet another generation to live in the same house. Tiffany, I would have left this comment as a reply to your comment, but I was not able to do so. I guess there are only so many levels of sub-replies allowed on the site. Since there was no ability to “Reply” to your latest post above, I am starting a new string of comments. Yes, I am aware that Elijah B. Martindale, along with Claypool and Hubbard, are the ones who platted Herron-Morton Place. The legal description for your neighborhood, as I’m sure you know, is Morton Place Addition. There are close to 300 lots with that legal description. In addition to what we now call Herron-Morton Place, Martindale also platted nearly a thousand other lots, many of them near the Morton Place Addition lots. Many of them have Martindale as part of the name of the legal description, so they are easier to identify than the lots that don’t include his name. They include such legals as Martindale’s Lincoln Park; Martindale & Co.; Hubbard, McCarty & Martindale; Vandeman and Martindale; Martindale & Stilz; Vonnegut & Martindale; Martindale’s Central Avenue; etc. He was certainly a busy guy! Excellent, Sharon! Forgot to mention the Sutherland family that owned farmland around the north of the former fairgrounds that were used as Camp Morton during the Civil War. One of the Sutherland family was on or head of the State Fair Board in the latter Nineteenth Century. Sutherland Avenue runs roughly parallel to Fall Creek, on the left bank side (left, as facing downstream; that’s why Paris’ “left bank” is where it is…facing downstream on the Seine River there, on the left). On north of 38th Street, out Millersville Road is the old Sutherland family cemetery, roughly across from the dairy that used to be near there (roughly west of the former “Meadows” area-apartments and shopping, and businesses. you are very welcome. Norm. Thank you for the article. I’m a great-great-grandson of Gerhard Ittenbach from 606 Fletcher Av.